This blog entry about the events of Monday, January 09, 2012 was originally posted on January 17, 2012. 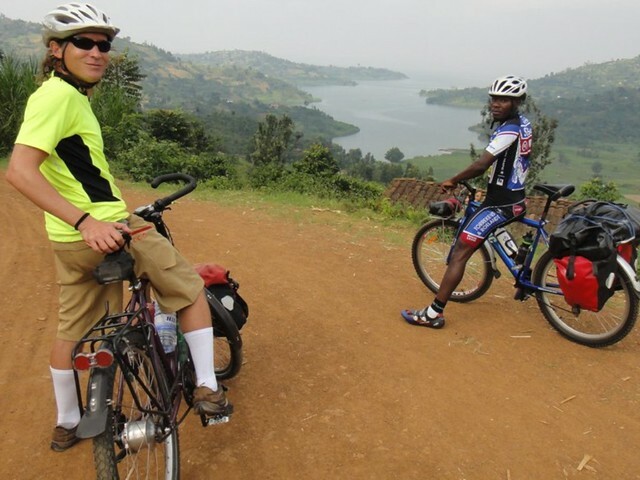 DAYS 11-13 (PART 1): “When you see the hills, you’ll see why you have a porter and nothing on your back,” said Tom of Rwandan Adventures, my guide for a two-day bike tour down the Congo Nile Trail (CNT), from Gisenyi to the trail’s mid-way point in Kabuye. Rwanda’s nickname is the “Land of A Thousand Hills,” and when cycling up my first big one (of 1,000), I knew exactly why Tom talked me into hiring a guy to carry my stuff — especially since my body’s sitting region was still sore from just having been kicked in the balls. I had been referred to Tom indirectly through the Rwanda Development Board tourism office; Norbert gave me contact information for a CNT consultant named Karim, who was busy but referred me to another CNT consultant Tom, a British ex-pat with African tourism experience, who was living in a lakehouse near Gisenyi with his wife Natasha — an international expert doing research on Lake Kivu’s underwater methane source. My hired porter was Twizere (pronounced Twizère), a young Rwandan man who had won the CNT’s inaugural race from Gisenyi to Kinunu — covering 40.3 kilometers in 1 hr. 23 min. This doesn’t sound too fast, but when you factor in the 1,300-ft. range of undulating elevation change and all the rocky, unpaved roads, you can appreciate such a feat. I appreciated him more for the fact that he was carrying my minimal load of things for two days (did I mention I was kicked in the nuts?) plus all the water we’d need to hydrate for the first leg of the trail. THE CONGO NILE TRAIL is Rwanda tourism’s latest endeavor — one that started in 2007, but officially opened in late November 2011 — created in part by the Rwanda Development Board (RDB), the United Nations World Tourism Organization (UNWTO), the Netherlands Development Organization (SNV), and UNWTO’s ST-EP Foundation — the latter two committed to sustainable, community-based tourism for eliminating poverty in developing nations. Branded to be Rwanda’s (and east Africa’s) next big thing, the CNT invites tourists to the trail for up to 10 days of hiking, five days of mountain biking, or two days in a 4x4 (depending on how far you want to take it), along the shores of scenic Lake Kivu. I had only found out about the CNT when looking up gorilla permit information on the RDB website last November, and was intrigued; western media hadn’t really caught wind of the CNT yet — most people in America still see “Africa” as a nationless place where you just go for safaris — but as a writer for Discovery.com, I hoped that I had some influence to help change that. Besides, I could have used the work out. “There are better things to do in Rwanda on foot,” Tom told me, adjusting my mountain bike and helmet in his courtyard to fit me perfectly. I would do the CNT via bicycle — one with front shocks thankfully — as I’m a fairly avid road cyclist at home. I soon discovered that the CNT is very much suited to be a mountain bike trail above the two other options, with challenging uphills and rewarding albeit rocky downhills. People don’t necessarily follow you if you drive in a 4x4, but a lot of the face-to-face interaction time with locals is inhibited by a windshield. It’s not a drive-thru safari after all; they’re people. THE CONGO NILE TRAIL WASN’T CARVED from scratch by the RDB or UNWTO; rather it is a formerly existing unpaved road — dating back to the German and Belgian colonization days — that connected coffee and tea plantations with little lakeside villages. Despite Tom’s no gifting rule, there weren’t many kids seen on the trail that morning since school was back in session — not that I had a basis of comparison, but Tom and Twizere raved at the welcomed change. It couldn’t have been a more perfect day weather-wise, as we biked up and down the rocky road through “a thousand hills” from La Brasserie, Gisenyi, home of the area’s main port, with shipments of grains coming in from Belgium for the nearby Bralirwa brewery. But grains and hops were about the only crops that needed to be imported; as far as I could see, agriculture was king in these parts, sustaining the country with a local food source — although a lot of the land was used for tea and coffee, the country’s main export. Tom made it a point to stop and talk with elderly gentlemen out of respect, each of them oozing with Rwandan charisma, with each wrinkle in their weathered faces representing the many events in history they’ve observed. In many cases, we’d give them our empty plastic water bottles — a welcomed gift to any adult villager; it’s not trash, but a reusable container for water, oil, or other liquids. Greetings and short conversations continued as we rode through several dusty villages along the way. The trail winded left and right, up and down, almost always with a postcard-worthy panoramas of Lake Kivu on our right side — a lake with many volcanically-formed islands within sight of the shore. A song-filled church came within earshot as we rode by one village, but it wasn’t until we arrived in Gahondo that we stopped for a real break for locally-made croissants and some Fantas. We were greeted by Tom’s friend Vivier, a local man who spoke in French. “It’s better to put money into the community rather than carry things ourselves,” Tom told me, as he was a big endorser of community-based tourism. Whenever possible, he’d support a local store in a village, mixing it up when possible — although in a small village there’s often only one or two places you can get snacks and drinks. “Why aren’t these kids in school?” I asked Tom, as we were surrounded by young on-lookers. Taking it easy on rocky inclines helped me conquer the long climbs of the morning — it’s better to take it slow on a low gear rather than stop and walk a bike up. We continued down the CNT, beyond Cyimbiri Falls, through more villages, farms, and lake views, until we arrived in Nkora, a Muslim fishing village, for a home-cooked lunch. “We won’t have lunch on the beach because it’s market day,” Tom told me. We rode through bustling Nkora, passing through the streets of on-lookers selling goods until we were greeted by local Isaac, who led us to his friend Abdullah’s house, where his wife had prepared us a lunch of fried potatoes and wild tilapia from the lake. It was there that I had my second encounter with Akabanga, the smoky, flavorful Rwandan hot sauce that only requires a few drops to liven up a dish — it conveniently comes in an eye-dropper bottle. “I always try and get a local guide because that’s what it’s all about,” Tom told me, introducing me to Saleh, a older teen who knew enough English to take me on a village tour after lunch. We walked around town — seeing the boats coming in from the DR Congo to trade goods in the market, the vegetable and potato vendors, the tailors, shoemakers, meat sellers, the vendors selling used clothes they’ve bought wholesale from organizations like the Salvation Army, and everyone else out for market day in what is otherwise a sleepy little fishing village. Beyond the village, we saw the local Nkora coffee washing (and drying) station, where villagers sold their coffee cherries at market price to be processed and exported. “Do you drink the coffee from here?” I asked Saleh. I asked because many coffee snob foreigners traveling to coffee-producing developing nations often wonder why locals still drink instant Nescafe. “[No, that is for exportation,]” Saleh responded. “[That’s how we make money. ]” A perfect explanation, everyone; they don’t drink their means. The nearby Nkora waterfalls provided for hydro-electric power — a fairly new energy source for villages like this one. “Electricity means less babies,” Tom had joked to me. “No more candles; they have television to just get tired.” However, the Rwandan population has grown over the years — more than before the 1994 genocide. Tom feared the overpopulation would result in agricultural land disputes in the coming years. We thanked our hosts Isaac, Adbullah, Saleh and family, and left Nkora behind us. ANOTHER FEW HOURS UP AND DOWN more of those “thousand hills” and we finally arrived at the junction with Kinunu, our final destination of the first day. We were the only mzungus on the trail, but not the only cyclists; several locals were on bikes — some carry groups of chickens on the back, some entire pigs. One guy had a flat and Tom and Twizere gladly helped him out. “Congratulations,” Tom wished me, raising his warm Coke to my warm Coke, after a successful first day — we had arrived an hour ahead of schedule, and I felt good. The lake views from the station only added to the moment. >. The premium beans had their own special roasting room, although in the dark it looked more like an interrogation room from Reservoir Dogs than something worthy of Starbucks. THE FOLLOWING MORNING, Beateh prepared us breakfast before we set off just after 7:30 in the morning, which included one of my favorite regional dishes, agatogo, a typical tomato and ground peanut-based stew with green bananas and dodo, a sort of collard green. Filled with that and Kinunu coffee (of course), we hopped back on the bikes and head back on the trail. “Vous partez ?” asked a worker as I started cycling back up the hill. You may opt to do the Congo Nile Trail without a guide, but I’d recommend one, and not just for the language translation. While there are official signs showing the way to go, in some forks in the road, there aren’t; they’ve probably been taken and sold for scrap metal. Also, while many base camps have been established for hikers carrying tents, they don’t necessarily have clean water sources. My apologies if this one is lengthy; I use my blog as the “everything I did” notebook for reference when I write tighter, edited pieces for articles later on.